Both sides agreed it was one ugly game, but Texas coach David Pierce prefers the alternative after a 7-6 win over Arkansas. The ninth-ranked Longhorns are just trying to survive a grueling month of March but already has a 9-4 record to show for it against several top teams. "We're gritty," said Texas designated hitter Zach Zubia, who had two of Texas' six hits on the night. Those hardy souls who braved the finale of the Texas-Arkansas baseball mini-series at UFCU Disch-Falk Field have to be hoping for one conclusive piece of data. Please don’t let Wednesday night’s marathon be a preview of the type of College World Series game this June. But what the near-four hour game lacked in esthetics made up for it in ecstatics. Like 6,260 ecstatic fans. In what was one horrendous display of baseball with wild and ineffective pitching, some sub-par fielding and little clutch hitting, No. 9 Texas beat No. 11 Arkansas 7-6, mostly because the rules insist one team has to win. And these are two legitimate top 10-caliber teams. After all, impressive Arkansas has now dropped just three of its 21 games all year, one an extra-inning contest to USC after hitting a homer in the top of the 10th for the temporary lead. And Texas has begun to raise the ugly win into an art form as neither used many of its top-echelon arms. There was little aesthetically pleasing about Wednesday night besides the clutch pitching of closer Cole Quintanilla for his fourth save in a game that included 15 pitchers and 18 walks and eight hit batters. But Texas came out on the right side to split this two-game set and, after being handed an 11-4 beatdown the night before, salvage a win that will look much better to the NCAA selection committee in two months than it did before the naked eye. For sure, four wins over SEC contenders LSU and Arkansas will greatly enhance Texas’ strength of schedule as the Longhorns try to navigate their toughest stretch of the season before heading to TCU this weekend, starting Friday. “It’s just a survival of March,” noted Pierce, whose team has run a gauntlet of tough foes like No. 2-ranked LSU and No. 6 Stanford this month and posted a 9-4 mark in March. April won’t be much kinder. Texas will catch powerful Texas A&M to start the month and Baylor that first weekend. That will mean the Longhorns will face the best three Big 12 opponents in their first three series. Winning two of three in Fort Worth would be huge. The Longhorns deserve a lot of credit against a Razorbacks team that had beaten them five straight in this testy rivalry. They well could have sulked after getting blasted by Arkansas on Tuesday and falling behind 4-0 in the second inning on Wednesday. An inordinate 14 walks and four hit batters by Razorbacks pitchers helped the cause. 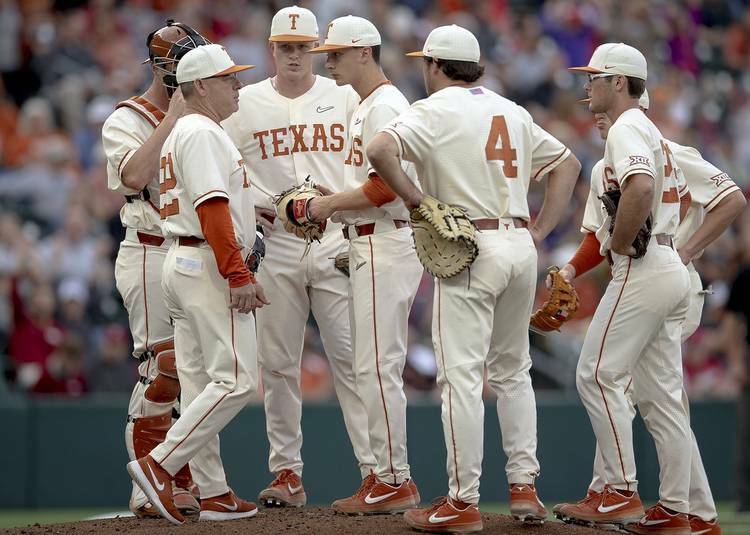 But there’s no sulking — or crying — in baseball, as far as the Longhorns are concerned. Furthermore, their 10th comeback win of the year provides further momentum for a flawed but feisty team that whipped Texas Tech two out of three last weekend and has now won four of the last six, entering another grueling series. Fresh on the heels of this intersectional rivalry comes a new Big 12 enemy in high-powered, 22nd-ranked TCU, which was picked third in the league preseason poll behind frontrunner Tech and No. 2 Baylor. Texas was chosen fourth. But Texas has been tested plenty. The Razorbacks are good. Real good. Maybe even College World Series-good again like last year when they came within a pop foul of taking the championship. They’re hitting .294 as a team with 18 home runs, even with last year’s freshman All-American Casey Martin scuffling at the plate. But with the identical approach to work the short game and manufacture runs, there may not be all that much difference between these two clubs, aside from a more powerful lineup for the Hogs. That won’t change. Texas managed just six hits in each game of this series — five of them singles on Wednesday — against a whole battery of mostly freshman Arkansas arms. But they were enough hits. They’ve already grown up a bunch in March.